Once the boot process starts, you see the menu in different languages. Each language gives you a choice of trying Emmabuntus Debian Edition 1.0 for "modern" (686), "old" (586 non-pae) computers or go directly into install mode. I selected the Live run of this distribution in English, and the boot process started. It took about a minute to boot, but eventually I saw the default desktop. Emmabuntus DE 1.0 uses Xfce desktop environment version 4.10. 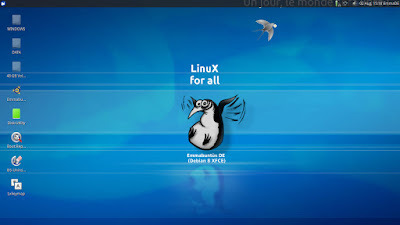 The default wallpaper in the distribution is about Emmabuntus itself with the funny penguin picture in the centre, while the distribution's name is also written underneath. There is a choice of several dozen alternative wallpapers already included in the distribution. There are some icons on the desktop including Install, Boot Repair and OS Uninstaller. The top of the screen is taken by the panel with the menu button on the left. The menu does not include the Search function by default. If you want to have the search facility, you need to remove the Applications menu and replace it with Whiskers menu using the standard Xfce panel configuration tool. The right part of the panel is a notification area with battery, network and volume indicators, clocks with calendar and the system menu for functions like shutdown, logout or reboot. Unfortunately, there is a text on the right part of the panel image that overlaps the notification area icons. That gives an unpleasant effect. Virtual desktop switch, quick launch buttons or "show desktop" button are not on the panel by default, but they are available via the standard panel configuration tool of Xfce. Several start-up applications run right after boot. These include keyboard configuration, dock configuration and non-free software installer. After running all these post-startup steps, the system used about 240 Mb of memory, which is rather decent. 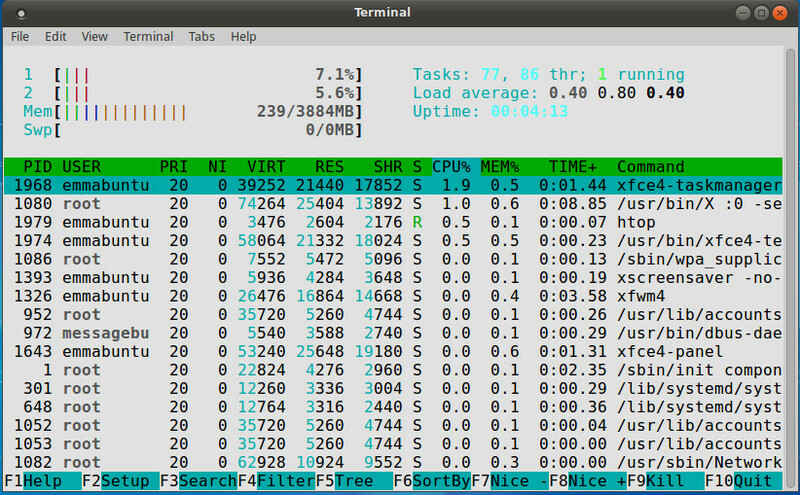 If you look at this screenshot, you notice that operating system sees 4Gb memory available on the laptop. I am not sure how that was possible for the 32-bit ISO image. There were no issues for me to connect to the WiFi network using Emmabuntus on my laptop with Realtek 8191 SEvB wireless card. It was configured automatically, and nearby networks listed. Unfortunately, I had no possibility to run the test of network drive connectivity this time. If you want to use several keyboard layouts and switch between them running Emmabuntus Debian Edition 1.0, I can refer you to the guide for Xfce layout configuration that works for this distribution too. Touchpad scrolling is configured for two-finger scrolling by default. You need to change that in the Mouse and Touchpad configuration panel item if you want to use edge scrolling instead. The ISO image size of Emmabuntus DE 1.0 is just under 4 Gb. The purpose of this distribution is to help people in remote areas to use Linux. It means that ISO image delivers a lot of applications for every taste. There are two browsers in the system: Chromium 51 and Firefox ESR 45.2.0. Both include several add-ons and plugins. Other Internet tools include FileZilla FTP manager, gPodder podcast downloader, IceDove mail client, qBittorrent and Transmission torrent clients and so on. LibreOffice 4.3.3.2 comes with the full set of its components in Emmabuntus DE 1.0 along with Gnumeric, Abiword and a dozen other office utilities. There are several simple games in the distribution like Sudoku and SuperTux. There are also several sets of children's games. Plus, there is a PlayOnLinux tool that may help you to run Windows-based games in Emmabuntus DE 1.0. Graphic tools include Pinta, ImageMagick, Inkscape, GIMP and several other image viewers and editors. Multimedia section of the menu has several different players, configuration, audio and video editing tools. Of course, there are simple utilities from the "find it everywhere" stack for archive management, partition management, backups, printer configuration and so on. If you don't like the existing set of applications, you can edit it with gdebi and Synaptic package managers. Unfortunately, there was an error when I tried to run Synaptic for the first time. It was about duplicate entries in the repositories list. 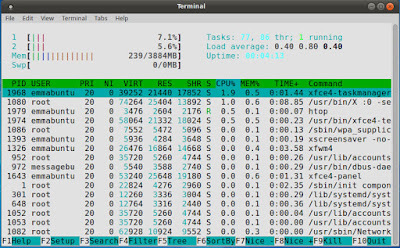 The list itself includes Debian repositories for Jessie (Debian 8.0) and several alternative repositories for applications. There is also one Ubuntu's PPA from Caffeine developers. I installed the suggested non-free software right after the start of Emmabuntus DE 1.0 using the start-up application. Unfortunately, that did not help to solve all the issues. There were no problems in playing MP3 files. YouTube videos also played well in the Chromium browser. However, videos on some other sites like cnn.com and 1tv.ru did not work for me. When I started the Chromium browser for the 1st time, it did not work well for me on the Blogger page. I had to close and reopen the browser to resolve that issue. Emmabuntus is developed by the team based in France. That's why French roots show themselves every now and again. For example, the default language for Google applications is French in the browser. French names are given to virtual desktops and so on. The mix of applications from different sources led to differences in the look of the windows. There were at least 3 different styles of window control buttons. You can see them on this screenshot. Emmabuntus Debian Edition is a nice distribution that works for the particular niche. It delivers Linux and computer enablement into remote areas of the world where computers are rare and Internet connection could be something exotic. That is why it contains "all you can eat" software in the same ISO image. I remember the early version of Emmabuntus which had many similar issues at that time. Most of them are no longer in the system. Let's hope that Emmabuntus DE will follow the case. There should be a CentOS spin that can have so many apps.included! CentOS is an unbranded RedHat compilation. Although, you can create your own off-spin of CentOS with the applications you prefer. worst name for a distribution EVER though. You can find the etymology of the word here.